In Uganda, predominantly in the south-west, the existence of the indigenous Batwa tribal people is threatened. Systematic discrimination has led to the Batwa people being marginalised both socially and economically, severely limiting their access to education, healthcare and employment. Since food is very scarce, children are often forced into neglecting school and some girls engage in sexual activities in exchange for money. A woman in a black skirt and a red and black jacket despite the hot sun emerges out of a soot-coated house with no door. With half of a cabbage head in hand and a baby strapped to her back, she sits on the bare grass a few metres away from the house. Alice Nyamihanda, our tour guide and translator, asks her what meal she has cooked, she frowns and says she is not sure because her husband has not yet returned. “My husband has gone to till one of the rich men’s land. He gives him food in return,” she says. Children in this Batwa community have to choose between going to school and looking for food. Many drop out. They prefer staying home to look for what to eat than go to school and starve, according Nyamihanda. “Finding food here is hard,” the woman says. “Everyone tries to look around. We sometimes till people’s land or wash people’s clothes in exchange for food. If we are lucky enough to find a sweet potato, we eat it raw. Finding fuel to cook is as hard as finding the food itself,” The woman explains. “The girls engage in sexual activity at a tender age, in exchange for money,” says Nyamihanda. This has escalated in early pregnancies and, spread of HIV/Aids. At 1.30pm, in Mikingo village, there is no sign of a meal being prepared anywhere. At one end of the soot-coated lined-up households are a few plastic bottles they use for fuel. Hardly have we said anything than some of the Batwa start gathering around us. They know Nyamihanda who has on several occasions interacted with them. Located behind the Kisoro District administration block, the community has 20 households which we learn were constructed by Muhavura Diocese. Some houses, however, have no windows or doors. Since the shelters are not enough for all Batwa that stay in the area, they had to improvise. They used sticks, leaves, from trees, cardboard paper from boxes of soap, polythene paper which they tie together to make shelter. They use nylon sacks or clothes for doors in the night. There are more than 60 households in the area. Each of these accommodates about five family members. Our new found friend offers to show us around the community. As we move, she picks plastic bottles and stuff them in her lesu and says her fuel for cooking is covered, adding that most members use these to cook. Nyamihanda, the education coordinator at United Organisation for Batwa Development in Uganda (UOBDU), says without land or the skills to compete in the modern marketplace, the Batwa have become marginalised, yet the surrounding tribal communities are non-supportive. “This is the reason the organisation has started a skills training programme for the Batwa, which enables them to get money for their sustainability,” says Nyamihanda. More Batwa are getting education as a way of improving their way of life and standards of living. Nyamihanda says some children are taken to boarding school but are often discriminated against. Although there are some communities of the Batwa that have been resettled in Kisoro, Kabale and Kanungu with livestock and small plots of land to cultivate, Mikingo and some other Batwa communities that were evicted from the Mgahinga National Park were not resettled. They therefore have inadequate land, worsening their livelihood. UOBDU, however, rents land for some Batwa so that they can grow their own food. The challenge has always been that the fertile volcanic land is expensive and the organisation has inadequate funds. They are then forced to settle for cheaper less fertile lands which they can afford. Batwa in the Mikingo community, despite being near the Kisoro District headquarters and the hospital, are far from the services offered here. According to Robert Kaben, the chairperson of the community, clinics and hospitals refuse to treat Batwa due to prejudice. This has increased the prevalence of HIV/Aids among the Batwa town-dwelling communities, according to Sr Justine Kato the officer in-charge of public health at Mutolere hospital. St Francis Mutolere Health Centre, commonly referred to as Mutolere Hospital in Gasiza, Nyakabande Sub-county, Kisoro District, is a private community hospital, about 4km from Kisoro Town. It is the only place where the Batwa seek health care without fear of segregation. Many Batwa women would go to traditional birth attendants (TBAs) for delivery. With sensitisation by the hospital, they slowly took up use of modern medicine. 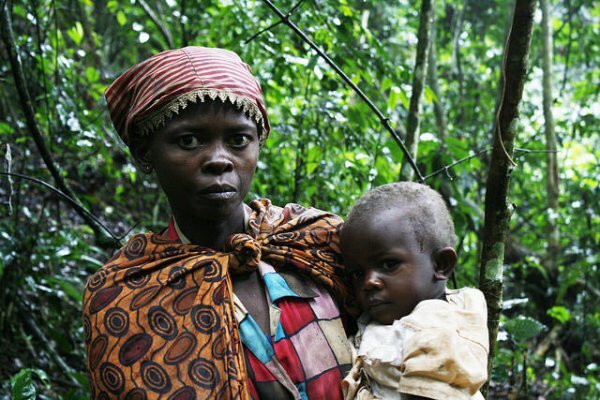 Lydia Kidandali, 25, a mother of two, says many Batwa lost their babies because of wrong advice. “We used to be delivered of children from home and there would be an old woman (traditional birth attendant) who would tell us to push. On my first time to push, at the point the baby was about to be born, I closed my legs because I felt a lot of pain, so the baby died. Many other women have lost their babies in the same way,” she recalls. In hospital, she says, there are several benefits because the doctors help in the handling of the baby so that even when the parents are HIV positive, they are able to give birth to HIV negative babies. She takes her ARVs religiously and uses Injecta Plan for family planning. Adherence to HIV drugs, according to Sr Kato is poor among the communities because they do not understand the importance of taking the medicine consistently. Also, the medication is strong yet they do not get enough food to eat since they have no land to cultivate. “I am HIV positive but my two children are negative. I was delivered of the first child normally but got complications with the second one and opted for caesarian section birth. Had I stayed home, I would have died. My husband and I take our ARVs on time and come to hospital for antenatal visits together,” says Kidandali. The nomadic nature of the Batwa people also makes follow-up difficult. Kato says more women seek medical care and have a higher adherence rate to the drugs. “When they take the ARVs, they become weak because they do not have enough food. After the reaction, they do not take them again and this affects their adherence to drugs,” she says. With the inception of the UOBDU, the Batwa community was able to get funding from Care Uganda and Sustain for Life. The organisation uses the funds to help the community get medical care. “When we get a donor, we ask them to directly contact the hospital so that when they run out of money the donor is notified. When the Batwa people go there, they receive free treatment. This programme has been running for some time now but the funds are almost finished, so we do not know what the next step is,” Henry Neza, the capacity building director at UOBDU says. Much as the hospital has been very helpful, many of them fear because the Batwa programme will soon come to an end. “We don’t know where we shall go thereafter,” says Kaben. In Kisoro Town, you can see many of the Batwa moving around in groups playing musical instruments as well as singing. And whoever feels entertained, gives them some money.